It takes place every Tuesday evening from 6-7pm and we meet outside Enderby Leisure Centre during the winter and outside Huncote Leisure Centre (Pavilion) during the summer. We run a variety of groups in both our Tuesday and Thursday sessions that cater for a wide range of runners, from those that are able to run for an hour with little or no stopping to those more competitive looking to make the prize places in races. The various groups will cover distances starting at approx. 5-6 miles and going up to maybe 10 miles in one session. In all groups there is still a focus on having fun! You are welcome to run with us for a couple of weeks to make sure you enjoy running with us, just come down and say Hi! After a couple of weeks though we would request that you become a member. Feel free to contact any of the Club’s Officers if you would like more details before you come to join us. Please see the Training Information page for more details. We book track sessions at Ratcliffe College in blocks of weeks at a time and these sessions are suitable for all members of the club at all ability levels (at the end of the day you are simply running in circles so there is no such thing as being left behind!). All of our club sessions are led by one of our club coaches or run leaders, who have all received the relevant training and qualifications issued by England Athletics. Our club coaches all carry the Coaching in Running Fitness (CiRF) qualification. Our run leaders all carry the Leadership in Running Fitness (LiRF) qualification. 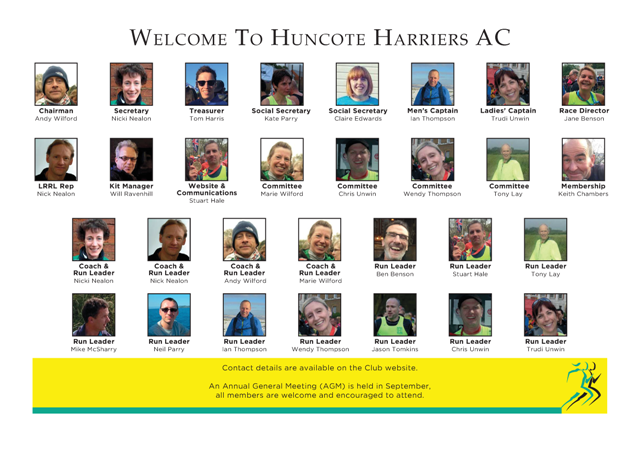 If you would like to see photos of our club coaches and run leaders so that you can recognise them when running with club, please refer to our ‘Guide to Huncote Harriers’.